Panera Bread is not a restaurant I review frequently, and not without reason. While their sandwiches are generally delicious and their baked goods top-notch, Panera Bread usually skews a bit more expensive than I’d like, especially when eating at a chain restaurant. However, I’d like to branch out a little bit, so I decided to swing by Panera last week and see what’s new. Full disclosure: I have no idea if the Cuban Chicken Panini is new or not. It just looked good. 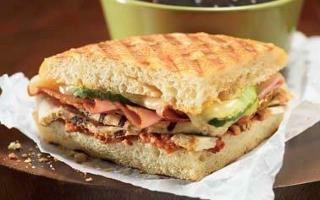 Reviewing the Cuban Chicken Panini requires a little bit of background. A Cuban sandwich is a ham and cheese variant which includes sliced ham, pork, Swiss cheese, pickles and mustard. It’s sort of like a Reuben, in terms of flavors (the mustard and pickles give it a bite), but less kosher. It’s a great lunch choice, and I recommend ordering one if you’re at a restaurant which offers it. Here, Panera has chosen to trade out the roasted pork for roasted chicken. It’s an interesting choice, and with the addition of chipotle mayo, it makes for a tasty sandwich. It’s a little bit different than a usual Cuban, but still close enough that the name makes sense, unlike some other sandwiches (looking at you, T.N.T Reuben). It’s about $8 for the sandwich and a drink, and well worth checking out, especially if you’re unfamiliar with the style. I recently found this website, and I can’t stop thinking about it. 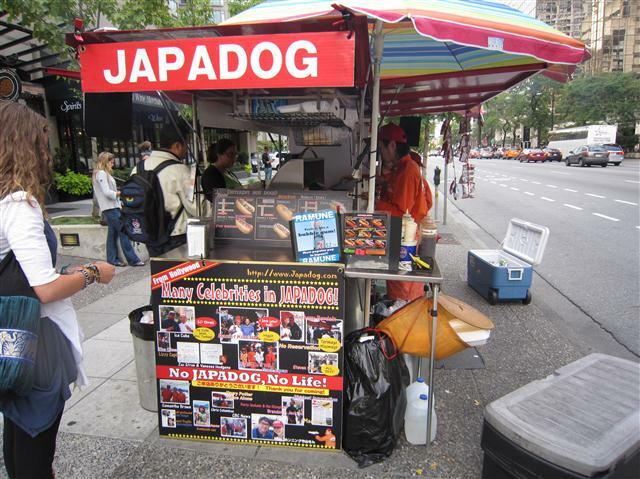 It belongs to a Canadian hot dog stand chain called JAPADOG, whose stated mission is “making the world happy and alive through hot dogs!” The chain boasts five locations in Vancouver and a new one in New York City. JAPADOG prepares their hot dogs “Japanese-style,” which means that they include a number of traditional Japanese vegetables, sauces, and even meats in their recipes. The thing I love most about JAPADOG is their boundless enthusiasm for hot dogs. The owners are truly living their dreams, as evidenced by the comparatively detailed history section on the website. Although the English isn’t always perfect, the website is fun and ambitious. It’s not often I come across someone whose passion for sandwiches rivals my own, and it’s a nice feeling. I have no idea what kind of hot dogs these are, but they look AWESOME. 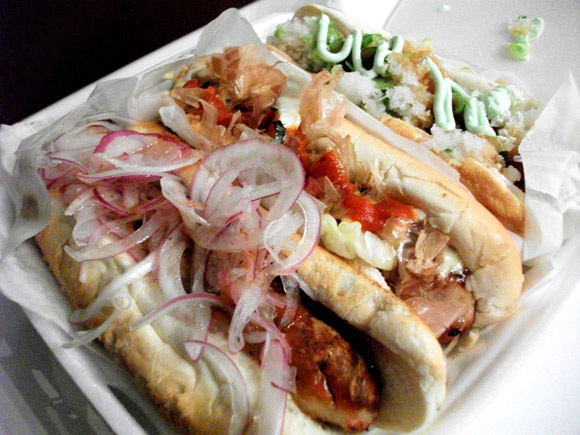 The hot dogs at JAPADOG also look delicious. I’ve always wanted to eat hot dogs with regional themese, and the use of Japanese ingredients lends it a somewhat classier look. (These are the kinds of recipes I expected from the famed Yesterdog of Grand Rapids, by the way. I got pickles and mustard with a side of condescension instead.) A couple offerings which look particularly tasty are the terimayo, which includes teriyaki sauce, mayo and seaweed, the yakisoba, which is an arabiki sausage topped with noodles, and the ebichiki, which is a shrimp sausage topped with chili sauce and dried shrimp. 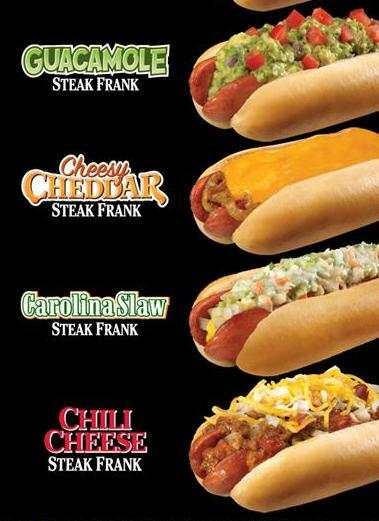 They also offer traditional undressed hot dogs, for the less adventurous visitors. All in all, JAPADOG looks great. I don’t anticipate being in Vancouver or NYC any time soon, but next time I am it’s definitely on my list. Anyone who’s in the area, be sure to check them out and let me know what you think in the comments. And on a related note, can any Japanese readers confirm that this is anything like how hot dogs are prepared in Japan? I honestly have no idea. Krazy Jim’s Blimpy Burger is another mainstay of Ann Arbor’s local restaurant culture. Established in 1953 and boasting the slogan “Cheaper than Food,” Blimpy Burger is known for their greasy, made to order cuisine, which includes burgers, french fries, and pretty much any other vegetable which can be dropped in a deep fat fryer. Blimpy Burger has been featured on both Diners, Drive-ins and Dives and Man vs. Food, with a spotlight on their quintuple patty burgers. It’s sort of the opposite of Zingerman’s, in that it’s cheap, unhealthy, and down-to-earth. It is also delicious. They also make these fantastic polar bear snow sculptures out in front of the building every winter!! Before I review the burgers themselves, I want to talk for a minute about the restaurant. Blimpy Burger cooks prepare your burger to order in front of you, and they have a kind of specific method of ordering. Like many local places including Grand Rapids’ Yesterdog, they have a monopoly on being them, so they sometimes treat their customers somewhat rudely. The guys working when I visited were great, but I know my brothers have had issues with some of the employees in the past, so be mindful of this. PRO TIP: if everyone (customers and employees) is patient with each other, we’ll all have a good time. I ordered a triple (three patties) with Bleu cheese, bacon, and mayo, and as I said before, it was great. The patties are kind of smashed together, which is fine by me. The bacon is freshly fried on the grill with the hamburger, and it made up about half the sandwich. 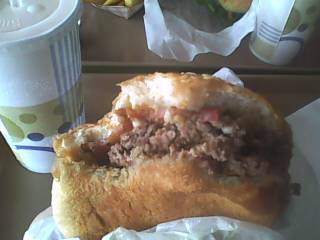 It was both thick and crispy, and really made the burger. The Bleu cheese wasn’t as prominent as in some other burgers, but it was a nice touch. Next time I might add some grilled onions or mushrooms, but all in all it was a satisfying, filling burger. Despite their slogan, it was a little pricier than I expected, since both the cheese and bacon cost extra. All told, my burger came to about $4.50, which I was fine with. My brother also got a basic double with lettuce, tomatoes, mayo, ketchup and mustard for about $2, which is a great deal. I’d definitely recommend Blimpy Burger for a quick, fun eat if you’re in downtown Ann Arbor. This marks Sandwichtalk’s 100th post, so I wanted to review something special. Zingerman’s is a collection of Ann Arbor-based restaurants and food retailers. It began in 1982 with Zingerman’s Delicatessen and has since expanded and evolved into a brand which includes a bakery, creamery, coffeehouse, and catering. Zingerman’s also created the charity Food Gatherers, a local hunger relief group I volunteered with a couple of times during high school. It’s a very well-known name within the Ann Arbor community, and probably one of the most famous, well-regarded restaurants in town. 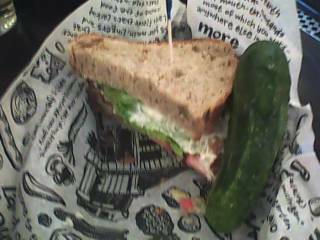 Zingerman's Deli. The building on the right is Zingerman's Next Door, a coffee shop with more seating. 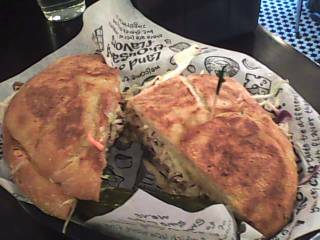 To get a more complete Zingerman’s experience, I tried two sandwiches. The first was a new sandwich, the TNT Cowboy Reuben. It’s a BBQ pulled pork sandwich with coleslaw and provolone on a sandwich roll. I’d hesitate to call it a reuben, but it was delicious nonetheless. Coleslaw is always a nice break from the usual tomato and lettuce route, and the combination of slaw and the pulled pork gave it an interesting, enjoyable texture. The provolone wasn’t as noticeable, but it didn’t hurt the sandwich at all. My other sandwich was the B.L.T., which I was a little less impressed with. It was a perfectly fine B.L.T. on their Jewish Rye, and all the ingredients were high quality, but I don’t know if it was worth the price, which I’ll get to in a sec. Again, I'd recommend it if you want a B.L.T., but you can make a B.L.T. at home pretty easily too. Both sandwiches were good and deserve high marks, but I do have to mention one other fact about Zingerman’s. It is insanely expensive. The TNT Cowboy Reuben cost $10.99, and the B.L.T. cost $9.50. $9.50 for a B.L.T.!!! And I ordered the smaller sizes, the larger ones run for a couple of dollars more. AND that’s just the sandwich and a pickle, no sides or drinks or special requests on the sandwiches (which will add 75 cents bare minimum, normally upwards of a dollar or two if you want special bread or something). These are pretty typical prices for the menu. You can get hot dogs for a dollar or two less, and the most expensive sandwich I saw was a smoked fish bagel which cost $20, but most sandwiches are $10 or a little bit more. I’m hesitant to say that any sandwich is worth ten dollars, and I’m a guy whose hobby is writing a blog about sandwiches. A lot of the cost is because almost all of Zingerman’s ingredients are either manufactured by them using super high quality items or imported directly from the source, as well as the whole “paying for the experience” concept (and I will admit that their corner location in Ann Arbor’s Kerrytown neighborhood is pretty cool). At the end of the day, though $10 for a sandwich is $10 for a sandwich, no matter how you sell it. I’d still definitely recommend Zingerman’s. The sandwiches I had were good, and with their dozens of menu items, I’m assuming they have a lot of other great sandwiches as well. I won’t be going back anytime soon, not with my budget, but it’s a great option for a place to celebrate, a fancy lunch date, or a place to take out-of-towners. P.S. Thank you to everyone who’s supported Sandwichtalk so far!! Be sure to let me know any questions, comments, or requests you guys have in the comments section, and here’s to the next hundred posts! !